A group of boys' bid to break open a used mortar shell so that metals inside could be sold as scrap ended in a tragedy when the artillery projectile exploded and killed two of them at an army firing range in the Dooars this morning. 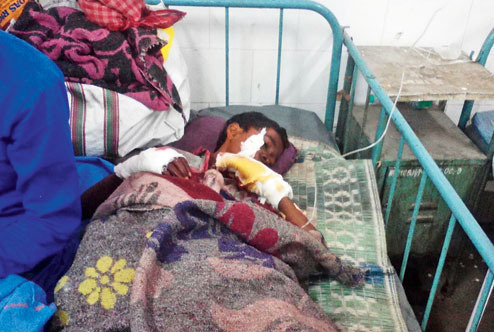 Two boys suffered serious injuries in the incident that occurred on the bank of the Teesta river in Bagracote under Malbazar subdivision, around 45km from here. Malbazar police have started an inquiry. The injured are under treatment at North Bengal Medical College and Hospital in Siliguri. Sources said five boys, aged between nine and 14 years and residents of Sonali Tea Estate near Malbazar, went to the army's firing range to collect used mortar shells around 6am. "It is usual for a section of children and youths from tea gardens and villages located close to the firing range to visit the area when the army men are not practising on the site. They collect used mortal shells, separate the metals inside the cylindrical projectile and sell the same as scrap," said a senior police officer. Today, Salman Oraon, 14, Raman Oraon, 9, Surajit Oraon, 12, Ranjit Oraon, 12, and another boy found a used mortar shell and tried to break open it with a hammer. "The shell exploded and Salman died on the spot. The four others suffered injuries. One of them was administered first aid and released from the health centre at Odlabari. Raman, Surajit and Ranjit were taken to NBMCH," said a source. "All three of them were critical as they had burns and splinters. Later in the evening, Surajit succumbed to his injuries. The other two are still under treatment," a source at NBMCH said. The police said similar incidents of people getting injured or killed while tampering with used mortar shells had happened before also at different localities of Malbazar subdivision. "The armymen do not allow anybody to enter the range during the practice. People stay away as they can hear ammunition being fired from different firearms. But when no practice is held, the site remains deserted and others sneak in to collect shells," the police officer said. Babulal Oraon, a Trinamul member of Bagracote panchayat, said the administration and the police should take up the issue with the army. N.N. Bhutia, the additional superintendent of police (rural) of Jalpaiguri, spoke to the army officers about the issue, sources said. Debasish Chakraborty, the subdivisional police officer of Malbazar, said: "Two boys have died in the incident. Preliminary reports suggest they were trying to break open the shell when it exploded."